The Promax Ultra is a combi gas boiler made and manufactured by Potterton. It is a condensing wall mounted unit that comes with a wide range of features that help in giving you an excellent and reliable boiler. With this unit being designed specifically for social housing and new build projects it comes with an output rating of 40 kW but is also available in a wide range such as 24kW, 28kW, 33kW and 40 kW - meaning it can fit a variety of properties. With this unit being the 40 kW version it is perfect for those properties that are larger with higher water demands. 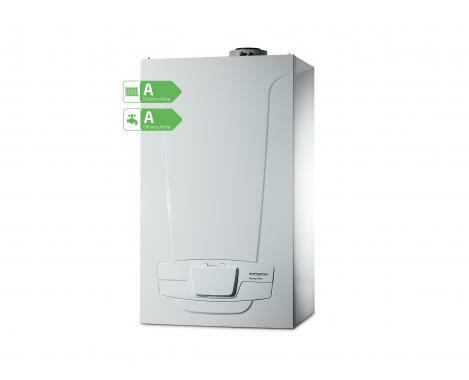 With it able to deliver hot water flow rates of up to 16.4 litres/minute it has an excellent SAP seasonal efficiency rating, helping it to be a cost effective boiler. This unit features a flueing option of up to 20m helping to offer flexibility in where it can be placed. It is able to suit both LPG and natural gas without requiring a conversion kit. This unit features a pre-plumbing jig, helping to save time and money on installation. It has a low N0x class of 5. It also has an efficiency rating of 89.1% making it a B rated boiler. With this unit also coming with 2 years warranty, you get the added security that you have bought a reliable boiler.